Hi, I’m Laura and I’m a Hufflepuff. I think life would have been easy if I’d had three little Hufflepuff children. We could have spent our days eating cookies and hosting playdates. 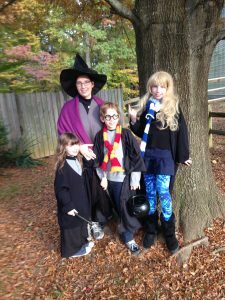 Instead, I had a Ravenclaw, a Gryffindor, and a Slytherin. That’s right, all four houses, living in the same house. I knew all their houses before they were two. Really. Gryffindor learned how to reach over a baby gate and pop it open before he turned two. As soon as he got the gate down he would run into the kitchen, climb on a chair, and be up on the kitchen counter where he would grab the largest knife he could find and brandish it like a sword. He also liked to explore what was at the bottom of every box of cereal by dumping the contents. Slytherin is the youngest. At only nine months old, we knew. Gryffindor, who was almost three, stole her doll one morning. She had me carry her with me to the kitchen where I was getting my cup of tea. She reached for a wooden spoon, which I handed her. Then, she reached to be put down with her spoon and crawled away with it. Five minutes later, I heard Gryffindor crying and yelling about how the baby had hit him. How did I parent this chaos? I read Ravenclaw every book I could find and let her lecture me about whatever her new interest was. I made a point of asking questions that made her think even more because she likes that. I got the Fort Knox of baby gates for Gryffindor, which kept him out of the kitchen for another year until he learned how to defeat it, too. By then he had Slytherin with him, either telling him not to do something or helping him make an even bigger mess. We got cable, and I put them in front of the television when I needed to take my eyes off of them to do exotic things like shower and pee. We all learned quickly that Slytherin was only “mean” when she was actually slighted, hurt, or the victim of some sibling activity. Rather than try to change her nature, I told the other two children to be nice to her because, “That baby is meaner than you are.” No one took her candy, stole her doll, or pushed her out of the way without getting bitten or worse. As long as it was for cause, I let it go. Why make more work for myself? If I stopped her from biting, I’d just have to put him in time out . . . right? Gryffindor and Ravenclaw learned how to treat someone smaller and weaker than them with respect. They also learned that cute and sweet are not synonyms. Homeschooling them as they’ve gotten older has actually been pretty great. Not only was Ravenclaw up for pursuing her own knowledge for the sake of knowledge, but she also enjoyed teaching her siblings all she knew. This gave me time to take a shower, cook dinner, or sit down and rest. 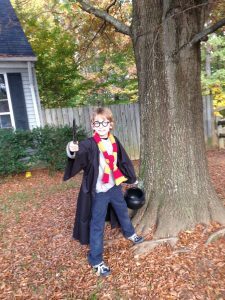 Gryffindor has a passion for Minecraft and virtual adventures and quests. I’m not very good at them, but I try to go along on a quest when I can find the time. He has actually build a few tutorials for me in Minecraft so I can learn. I’m amazed at his thoughtfulness about how to make small goals I can attain, knowing that I’m as likely to walk into the lava and die as figure out how to go around it. Slytherin is actually a joy to raise. She’s passionate about learning and trying everything and she makes followers, I mean friends, everywhere we go. I suppose her extensive knowledge and charisma will make ruling the world easier; however, she says that she doesn’t want to rule the world. “That would be too much work. Think how hard it would be to collect all those taxes,” she tells me. She just wants to be president. 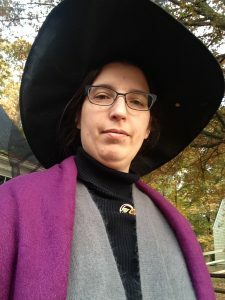 As a Hufflepuff mom, I harness my own powers. I respect each of them for who they are and I bake cookies.